The Tok Mueng Batik (TMB) Group is located at the port of Kantang in Trang Province, South of Thailand – a tsunami affected province. This batik group began with twelve women participants, and was selected in 2009 to receive financial and advisory support from the project whose objective was to empower disadvantaged women who have been affected by the Tsunami of 26th December 2004; to develop creative livelihood opportunities; diversify income sources to reduce vulnerability to environmental shocks; and to help them make optimum use of additional household income for the benefit of their children’s health and education. An outstanding achievement during this project year 2010 was when Tok Mueng Batik Group was selected from all craft groups in Trang province to receive the prestigious award from the Royal Crown Princess in recognition of their contribution in preserving Thai Culture through Batik Art. The ceremony took place on 4 April 2010 and was attended by the Chairwoman. The Nature Batik Club was informally set up in early 2008, starting out with 14 women participants on Libong Island. Later in the year, the group was also selected by the project to receive financial and advisory support which led to a more organised and formal set up. Being island based, the approach towards their co-operative is more simplistic. This is evident from their organisational structure which has only two positions. (1) Chairwoman: controls the overall management of the group (2) Deputy Chairwoman/Accountant: In charge of the central fund and when there is an order, will use this money to purchase the raw materials needed for production. Choices of appointments to positions are voiced out at meetings with members concurring to the selection. This system is commonly used in local island village settings. 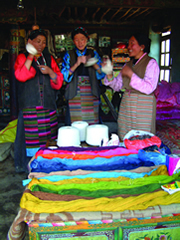 The Post-tsunami Women’s Livelihood Restoration Project’s support for the Tok Mueng Batik Group and the Nature Batik Club has included provisions such as instructions in basic batik painting for new beneficiaries; sourcing and support for new designs by an Italian volunteer artist; training beneficiaries in the group to produce this new design on scarves which has led to the first commission of ninety five pieces for test-marketing in the UK; revolving fund contribution; consultancy support towards the achievement of Government certification (OTOP); financial and advisory assistance towards local marketing efforts; strengthening of group structures; administering accounting procedures/ practices and loans and savings systems. The project furthermore conducted a sharing workshop on Tsunami early warning systems in which practical issues were discussed, highlighted, and steps identified for what they should do when faced with an emergency. New beneficiaries have also undergone training and to date, both batik groups combined now has a total of fifty one women beneficiaries – all skilled in the art of batik painting, with the ability to produce items of good quality and standard.